St Gwenfaen’s is on a raised site with spectacular views over a wide area of Anglesey, as well as the mountains of Snowdonia and the Llyn peninsula. At one time Rhoscolyn, once called Llanwenfaen (Church of Gwenfaen), was an important church with chapels of ease at Llanfair yn Neubwll and Llanfihangel yn Nhowyn. There has been a church on the site since 630 AD, when it was dedicated to Gwenfaen, daughter of Pawl Hen of Manaw (Isle of Man), who made her cloister here. Legend has it that Gwenfaen, who was renowned for healing mental illness, was chased away from her cell by druids and escaped by climbing the rock stack off Rhoscolyn head. The tide came in and she was carried away by angels, which is how Saints Bay got its name. A later church, built around the 15th Century was destroyed by fire. The present church is the result of rebuilding between 1875 and 1879 – when the chancel was added by R.G Thomas of Menai Bridge. The 15th century late Gothic doorway was inserted into the south wall of the new church and a porch was added. The bell-cote contains a bell dated 1611. The font is from the 15th century. It is octagonal with unusual decoration. Also uncommon for a small country church, there is fine stained-glass in all the windows. The windows above the altar are particularly beautiful and use for their representation of the sea a depiction of Christ on the sea of Galilee a depiction of Rhoscolyn bay and the Beacon Rocks. They were made by James Powell & Sons around 1912, from an early design by James Hogan, who later designed most of the windows in Liverpool Cathedral in the thirties and forties. Whilst this was original, designed specifically for St Gwenfaen’s, the windows on the south wall of Saint George and Saint Michael were made by Morris & Co in 1919 to designs by Burne-Jones. Morris & Co also made six single light nave windows (1920-22). Amongst the more notable monuments are those for the Owen family of Bodior, including a provincial Baroque one to John Owen of Bodior, 1709. In the churchyard stands a monument to five crew members of the local lifeboat who died during a storm in December 1920, trying to rescue the crew of the “Timbo”. Some distance from the church, on the west slope of Rhoscolyn headland, stands St Gwenfaen’s Well, whose water is credited with curing mental problems – traditionally an offering of two white quartz pebbles had to be made. 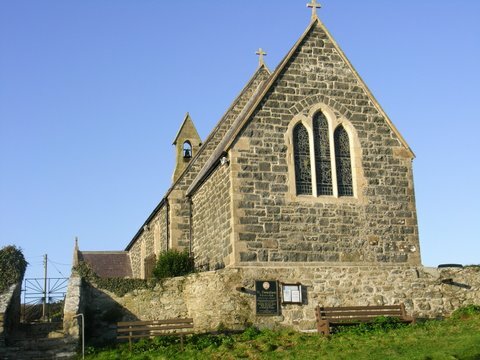 St Gwenfaen’s Day is celebrated every year with a special service of Holy Communion in the church, refreshments in the hall, followed by a walk across the headland to the well for a blessing ceremony. You will find service times of all four churches on this website.